With spring breaks wrapping up, more and more top teams are returning to the field, and the schedule offers a couple of solid Top 10 matchups you’ll want to check out. 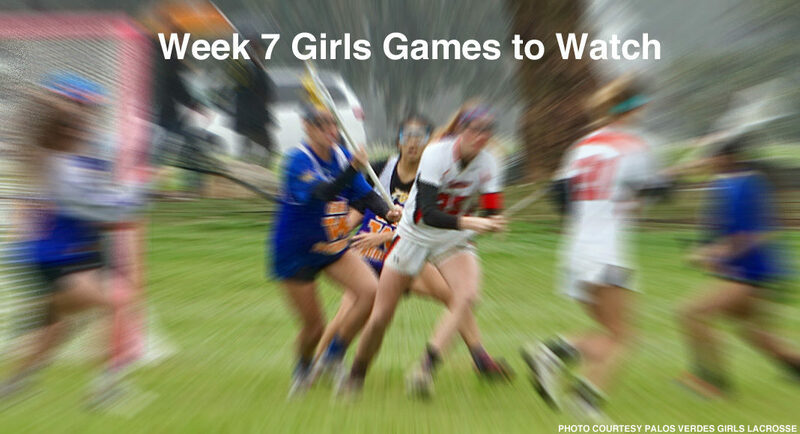 Tuesday, 17 of the Top 25 girls teams are in action, including seven games with ranked teams squaring off and two of those featuring Top 10 teams going head to head. No. 8 Newbury Park will get a rematch against Marmonte League rival No. 3 Westlake; the Warriors won the first meeting, 12-9 two weeks ago. Also, No. 4 Glendale takes on No. 5 Crescenta Valley. Wednesday offers another meeting of highly ranked teams when No. 2 Palos Verdes travels to face No. 3 Westlake in a top-three match-up. The teams met in the Rose Bowl Jamboree in early March, with Palos Verdes winning 7-6 in a shorter, tournament-style game. Thursday, No. 9 Agoura takes on No. 11 Oak Park, and No. 2 Palos Verdes takes on current Orange County No. 1 Foothill. No. 17 Marlborough at Notre Dame, 5:30 p.m.
No. 8 Newbury Park at No. 3 Westlake, 6:30 p.m.
No. 5 Crescenta Valley at No. 4 Glendale, 4 p.m.
No. 14 Cate School at No. 7 Chaminade, 3:30 p.m.
No. 6 West Ranch at No. 18 Valencia, 6 p.m.
No. 10 Downey at Dana Hills, 5:30 p.m.
No. 19 Simi Valley at No. 11 Oak Park, 7:30 p.m.
No. 20 Thousand Oaks at No. 12 Oaks Christian, 6:30 p.m.
No. 13 Palisades at No. 16 Birmingham, 3 p.m.
El Segundo at No. 17 Marlborough, 3 p.m.
Edison at No. 25 at Long Beach Poly, 4 p.m.
Hamilton at El Camino Real, 3 p.m.
No. 2 Palos Verdes at No. 3 Westlake, 6:30 p.m.
No. 15 Mira Costa at No. 16 Birmingham, 4 p.m.
No. 22 Peninsula at No. 24 Culver City, 7 p.m.
No. 11 Oak Park at No. 9 Agoura, 6 p.m.
OC No. 1 Foothill at No. 2 Palos Verdes, 4:30 p.m.
Westridge at No. 5 Crescenta Valley, 3:30 p.m.
Santa Barbara at No. 14 Cate School, 4 p.m.
No. 17 Marlborough at Louisville, 7 p.m.
No. 19 Simi Valley at No. 23 Royal, 7:30 p.m.
No. 7 Chaminade at No. 12 Oaks Christian, 6:30 p.m.
No. 6 West Ranch at La Canada, 4 p.m.
No. 15 Mira Costa at No. 4 Glendale, 4 p.m.
No. 13 Palisades at El Segundo, 3 p.m.
Millikan at No. 25 Long Beach Poly, 3 p.m.
No. 10 Downey at San Marcos-San Diego, 12:30 p.m.